Iceland has been on the top of my travel list for some time. For two years my sister and I planned a trip as a gift for ourselves after we both graduated from college. 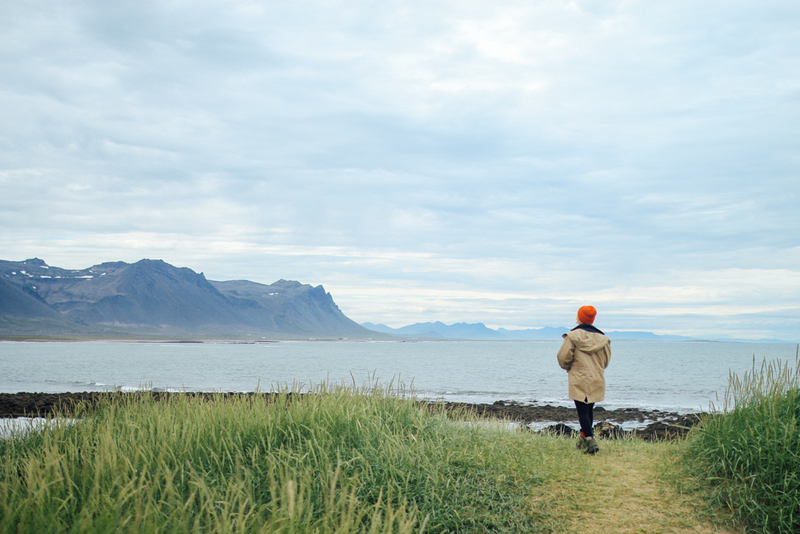 We changed our minds over and over until we landed on visiting Iceland. So after graduation and previous months of planning, we left for three weeks to explore the unworldly country of Iceland. After almost fifteen hours of catching up on sleep, Sophie and I picked up our bright red cherry of a Jeep, signed the papers, set up our bed, packed her up, and hopped on the Ring Road and started our journey around the country. The first place we stopped was at Grábrók Crater, which apparently means "gray pants" in Icelandic. It was my first time seeing and being in a lava field and I was way to giddy about it. I climbed to the top, soaked in the views, and allowed the Nordic temperate breeze to give me goosebumps. Though maybe they were from how overwhelmingly excited that this was the beginning. From Grábrók, we entered the Snæfellsnes peninsula, which proved to be one of the most beautiful peninsulas in the country. We drove in between beautiful beaches and tall mountains and waterfalls the entire time with the Snæfellsjökull glacier in the distance. We kept making stop after stop after stop. One of us would scream "Oh my god! STOP right NOW!" and it went on the whole day like that. Even our first camping spot off the road was amazing. One of the first things that caught our eye the next day was Bjarnarfoss, which was casually behind a guesthouse. Not too shabby of a backyard. Literally across the road was Búðir and Búðakirkja. This is still one of my absolute favorite places in the whole country. My jaw stayed dropped. Around every corner was another beautiful surprise and they were endless. It was life imitating art. Besides a few amazingly ignorant neighbors, it was such a magical evening. The sunset was SO incredible. The midnight sun is worth staying up for if the skies are clear. By the way, the sun sets close to midnight and then rises at 3 or 4AM. Watching the sun set diagonally behind the mountains had us feeling so warm and fuzzy and I don't think it was entirely the whiskey. 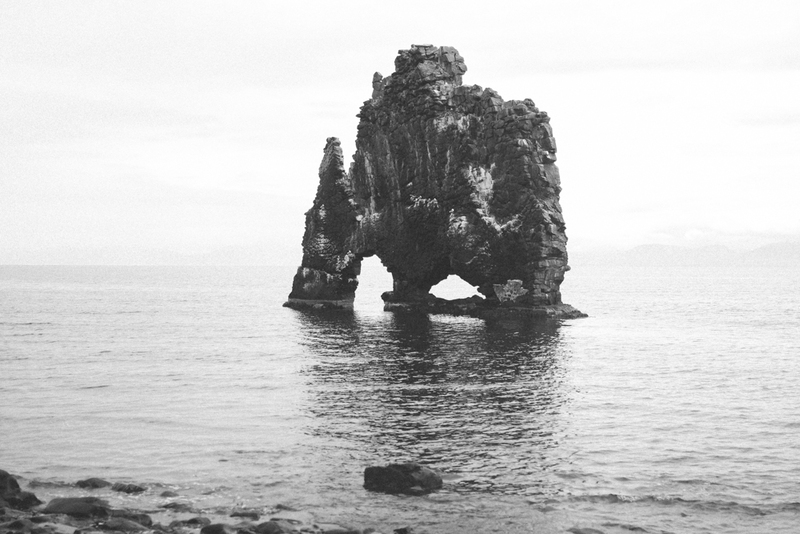 On our way out of the peninsula we stumbled across a few scenic treats like the Hvítserkur formation. We drove through the rainy valleys (beware of aggressive sheep that try to chase you off cliffs) of northern Iceland, learned about the "Old Road" from a sweet native, and headed to the lava fields of the Highlands. The landscapes change so drastically in this country, it felt like we were on a different planet every day. We camped on what felt like the moon. In the middle of the lava fields and dirt was the huge, very wet, and lush Godafoss. Nothing like starting the day surrounded by rainbows and then ending it in a bright blue geothermic pool while the sun sets at the the Myvatn Nature Baths. Also, shout out to the extra battery in the Jeep that supplied us with a heater during the night. Glamped so hard and I don't even care. We weren't sure what to expect from the east. It definitely changed dramatically from looking like Mars to super lush and mountainous. The scariest part wasn't even driving on the side of a mountain the whole time. Driving through the mountain in a single-car tunnel brought up a lot of anxiety, especially because we had to guess if we were in the clear or not. But this tunnel took us to some sweet sea-side villages and this amazing nature preserve with all of the ocean views, cliffs, wildflowers, crystals, and a coastal cave and waterfall. Going into the southern part of the country, the rocks and mountains became black with bright vegetation and everything covered in a blanket of fog. In the midst of the colors was this exuberant light house. At that point, I knew saving the southern part of Iceland for last was a solid decision. We started driving along Vatnajökull and made many stops to see the glacier in the distance, including a stop at some hot springs with a view of the oozing ice. We eventually came across the famous iceberg lagoon. Watching these icebergs float into the ocean is pretty wild. Especially with all of the seals swimming up stream and dodging the icebergs breaking off and crashing into each other. It felt like we were in Antarctic. It was so dreamy. This is one of the most special places in Iceland without a doubt. Not too far from the iceberg lagoon were some historic traditional turf houses. This farm had the most amazing backyard; large cliffs and their own waterfall. Every farm seemed to have their own waterfall. Right outside the scenic village of Vík was the amazing Black Sand Beach, which was home to towering basalt columned caves, rock formations, and SO many puffins. It's so serene when there aren't bus-loads of other tourists visiting. We made a stop to see the spooky Dc-3 Plane Wreckage. Little did we know the walk was an hour in. The walk to the plane was on this flat, black gravel, surrounded by heavy mist and eventually rain. It felt like we weren't moving at all. It set the mood for when we actually got to the plane. Gloom and doom. Seeing it in person is very unsettling and surreal. It almost felt like a movie set. It was bizarre to see kids playing in the plane and couples taking pictures of exchanged kisses on the wing. Though tragic, it was still beautiful. Right up the road, were all of these amazing waterfalls and hot springs. We hiked to the amazing Seljavallalaug, a gorgeous geothermic pool in the middle of some small mountains. They say the Brit's have their tea rooms, the German's their biergartens, the French their cafes, and the Icelanders their geothermic pools. That night we camped right in front of Skógafoss. If there was anything about Iceland that took me by surprise, it was how easy it is to get to most of these spots. Everything is pretty much right off the ring road, some places more touristy then others. Skógafoss has it's own two hotels, bistro, and tourist shop.